Many clinicians advocate either waiting for intoxicants to clear before clinically reassessing the c-spine or progressing to MRI. Both theses approaches have obvious drawbacks. Waiting til intoxicants clear requires prolonged immobilisation of the, often non compliant, intoxicated trauma victim with the associated risk of aspiration, struggling and its associated risk to the uncleared cspine, and risk of assault on staff (3). Furthermore it is yet to be established as to how intoxicated one needs to be to fail to notice that you have broken your neck! MRI is associated with a significant false positive rate, increase in aspiration, prolonged immobilisation time, cost, transport risks and a high likelihood of unacceptability to the intoxicated person (3). MRI is also not available at many centres, and is rarely available during the hours when people present with intoxicated trauma. This raises the question: Is it safe to clear the c-spine of the intoxicated blunt trauma victim with suspected c-spine injury with plain CT C spine alone? A recent paper in The Journal of Trauma and Acute Care Surgery suggests that it is. Cervical spine evaluation and clearance in the intoxicated patient: A prospective Western Trauma Association Multi-Institutional Trial and Survey J Trauma Acute Care Surg Volume 83, Number 6 was published in December 2017. It describes a multicentre study involving 10 191 adult patients with blunt trauma who were enrolled and underwent CT Cspine during the initial trauma evaluation. The majority were men (67%), had vehicular trauma or falls (83%), with mean age of 48 years. The overall incidence of Cspine injury was 10.6%. those who had been identified as intoxicated comprised 30% of the cohort (19% EtOH only, 6% drug only, and 5% both). Intoxicated patients were significantly younger (41 years vs. 51 years; p < 0.01) but with similar mean Injury Severity Score (11) and Glasgow Coma Scale score (13). The intoxicated cohort had a lower incidence of Csp injury versus non intoxicated (8.4% vs. 11.5%; p < 0.01). This is likely to represent the higher likelihood of imaging in this group as it was not possible to clinically clear them and hence a greater proportion of this group would have been imaged. In the intoxicated group, CT had a sensitivity of 94%, specificity of 99.5%, and negative predictive value (NPV) of 99.5% for all Csp injuries. For clinically significant injuries, the NPV was 99.9%, and there were no unstable Csp injuries missed by CT (NPV, 100%). When CT Cspine was negative, intoxication led to longer immobilization versus sober patients (mean, 8 hours vs. 2 hours; p < 0.01), and prolonged immobilization (>12 hrs) in 25%. An associated survey of clinicians behaviours and attitudes showed marked variations in protocols, definitions, and Cspine clearance practices among participating centres although 100% indicated willingness to change practice based on the outcome of the trial. The trial was well designed and powered with an a priori power analysis based on an estimated incidence of clinically significant cervical spine injury of 2% was performed as previously described, and estimated a sample size of 5,350 patients was needed to achieve an 80% power with statistical significance at the 5% level. The key finding was that the NPV of a normal CT Cspine was 100% for the presence of a clinically significant C-spine fracture or injury. A cervical spine injury was deemed clinically significant if it required surgical stabilization or placement of a stabilizing orthotic brace. Average cervical spine clearance times among patients with no identified neurologic deficits and a negative cervical spine CT scan (all differences between TOX+ categories and sober groups statistically significant with p < 0.01). 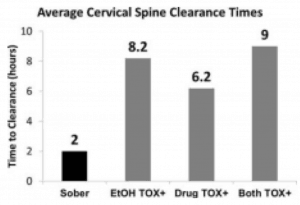 This clearly demonstrates a significant delay in the clearance of the c spine in the intoxicated groups compared to the sober cohort. If we are to accept that the NPV of the normal CT is 100% we can now reduce most of these times to the same as the sober cohort and avoid the associated morbidity, cost and inconvenience of prolonged immobilisation. The paper addressed attitudes to the clearance of the c spine of the intoxicated patient and the clinicians reasons for their decisions, there was also a very illuminating section of the definitions of intoxicated used at the 17 centres included in the trial which showed significant heterogenicity. 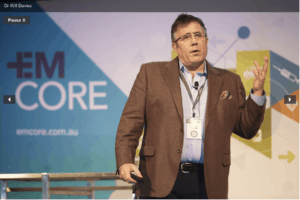 I will be further discussing these and other points raised in this important paper at EMCore Hong Kong in April 2018. Hoffman JR, Wolfson AB, Todd K, Mower WR. Selective cervical spine radiography in blunt trauma: methodology of the National Emergency X-Radiography Utilization Study (NEXUS). Ann Emerg Med 1998;32:461–9. Dunham CM, Brocker B, Collier D, Gemmel D. Risks associated with magnetic resonance imaging and cervical collar in comatose, blunt trauma patients with negative comprehensive cervical spine computed tomography and no apparent spinal deficit. Critical Care 2008;12(4). Matthew J. Martin, MD, Lisa D. Bush, PA-C, Kenji Inaba, MD, Saskya Byerly, MD, Martin Schreiber, MD, Kimberly A. Peck, MD, Galinos Barmparas, MD, Jay Menaker, MD, Joshua P. Hazelton, DO, Raul Coimbra, MD, PhD, Martin D. Zielinski, MD, Carlos V.R. Brown, MD, Chad G. Ball, MD, Jill R. Cherry-Bukowiec, MD, Clay Cothren Burlew, MD, Julie Dunn, MD, C. Todd Minshall, MD, Matthew M. Carrick, MD, Gina M. Berg, PhD, Demetrios Demetriades, MD, PhD, William Long, MD, and the WTA C-Spine Study Group, Portland, Oregon. Cervical spine evaluation and clearance in the intoxicated patient: A prospective Western Trauma Association Multi-Institutional Trial and Survey. J Trauma Acute Care Surg; 83,6: 1032-1040. This would suggest that we also don’t need MR in the ventilated patient to look for significant ligamentous injury.